Abstract: IWill has made quite a name for themselves by catering towards the enthusiast market with a wide lineup of good motherboard solutions. IWill has made quite a name for themselves by catering towards the enthusiast market with a wide lineup of good motherboard solutions. With their extremely successful KK266, and KK266 Plus line of boards that won the hearts of overclockers and enthusiasts abroad, not to mention numerous awards, it’s no wonder IWill would try to produce the “ultimate” overclocking board. Looking at the XP333-R by the spec’s, you'd think that this board has it all, plus the kitchen sink. One 4x AGP slot, five PCI’s, on board hardware 5.1 audio which uses the C-Media 8738 chipset (about the same quality level as a SB Live! based card), on board Ultra 133 RAID support care of Highpoint’s HPT372 controller. The best part of all however is the 1/5th, 1/6th PCI divider and a 2/5th and 1/3rd AGP divider. This is one feature rich board! Iwill and Acer Labs Inc. (ALi) have always had a very close relationship. Iwill's first DDR-based board was the KA266, however the performance was not what people expected, especially out of a DDR chipset. It was just plain slow, slower then most SDR setups and quite a bit slower then the AMD 760 chipset. Many of the problems wound out to be due to a sub-par memory controller, but ALi's reputation had already been tarnished. With even lousier boards like the Asus A7A266 and its many compatibility problems (before I get flamed by everyone, yes I have used the A7A before…) things certainly didn't look good for ALi. Going back to the drawing board, ALi dramatically improved performance with its B0 based Magik 1. In fact, the performance of that chipset was on par with the AMD 760! 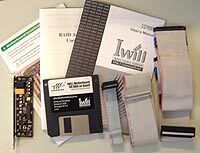 Still, motherboard manufacturers stayed away from ALi except for Iwill that is. IWill released the KA266 which used the ALi Magik 1 chipset. The KA266 was actually a decent board, but it faced another hurdle as there was a new king in town, VIA’s KT266A chipset which simply whooped everyone. To compete, ALi had to revise the chipset yet again, and with the C0 stepping, performance was supposed to be similar to that of VIA's KT266A. That brings us to where we are today and the board under the spotlight is the XP333-R is based on that exact same stepping. So let's take a look at the board! The layout of the XP333-R as can be seen in the above picture as overall very good. There is lots of space around the CPU socket so you can install larger heatsinks and the memory is readily accessible. The power filters are all neatly lined up in rows by the ATX power connect and the northbridge has a very snazzy active heatsink on it! The only real complaint I have about the XP333-R in terms of layout is the placement of the floppy drive controller. Since I personally like to use full tower cases, there could arise some problems since the floppy cable may not be quite long enough to stretch that far down the PCB - just think the HX-08 from AOpen. 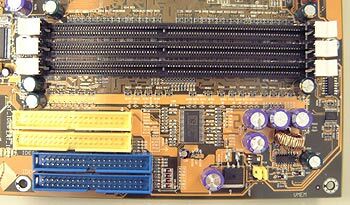 Also, the FDD connector potentially interferes with full length cards being used in the 3rd PCI slot. However, the absolute biggest issue with this board is the fact that Iwill calls this a DDR333 capable board. And while yes that is technically correct, and you should be able to hit 166 MHz FSB, there isn't a option in the BIOS to run your memory +33 MHz when you're running your system at stock 133 MHz FSB speeds. So in that way it is not a 'true' 333-based board like any of the newer SiS645 (P4) or the SiS745 (AMD) systems, or even for that matter VIA's up and coming KT333 chipset. Usually when one thinks about on board audio, we think VIA's AC'97 codec or something close to that in terms of quality. This is the same chip that you'll hear time and time again - spend the extra money and get a real sound card. IWill thankfully, bucked with the trend and went for the more capable C-Media 8738 chip. IWill has always seemed to take pride in their boards, and equip them with much higher quality sound chipsets, and for this we are glad. The C-Media 8738 chip has sound quality on the same level as the SB Live! series of cards, which says a lot about its quality. Apart from the standard set of audio connectors just below the gameport, the XP333-R also came with the 6-Channel Audio adaptor - basically a slot cover with jacks for central bass, and rear speakers. The SuperAudio adaptor is similar, but with four extra ports that would give you the two jacks we already mentioned RCA SPDIF IN and OUT, and Optical SPDIF IN and OUT. 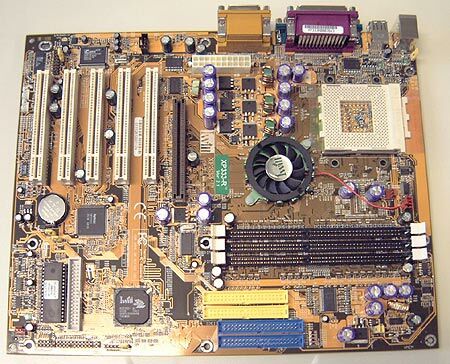 Unlike earlier motherboards, the XP333-R comes with a HighPoint HPT 372 Ultra133 RAID controller. This chip makes the XP333-R capable of RAID's 0, 1 and 0+1. It is also capable of being used as a stand alone IDE controller so it is much more versatile then the more common Promise Ultra100/FastTrak Lite most manufacturers like using. IWill's ALI 1535D+ southbridge on the XP333-R is also capable of 133 MB/s burst transfer rates, and neither IDE controller is affected by the 137 GB limit. Rounding out the other bits and pieces that the XP333-R offers users are; jumper controlled VCore, Keyboard power on, 3rd USB connect, 3 fan headers, WOL, WOM, and Duron, Athlon and Athlon XP processors and upto 3GB of PC1600/2100/2700 DDR memory.